Periodontal diseases are those diseases found around the teeth which affect the supporting structures of the teeth. “Peri” means around, and “dontal” means tooth. 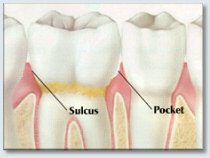 Periodontal diseases affect the tissues around the teeth including the gum tissues and the bone. Periodontal Disease is one of the most common and serious dental problems today. People of all ages may experience symptoms of this disease, which can lead to tooth loss if not detected early. The accumulation of bacteria found around teeth is called “plaque”. When plaque is not removed for 24 hours or more, the plaque becomes calcified. Calcified debris around teeth is called “tartar” or “calculus”. Calculus is the “barnacle” that grows on human teeth. The bacteria (plaque) and build up of calculus cause bone loss. Eventually, teeth become loose, and may be lost. Treatment can limit damage and help keep your mouth healthier. Laser Assisted New Attachment Procedure (LANAP) is the newest technology for treating periodontal disease. Dr. Carol Stevens is trained and certified in LANAP and offers her patients this alternative to conventional gum surgery in her Port Charlotte office. So whether you have healthy gums and want to keep them that way, or you already have gum disease and want to control it better, periodontist Carol W. Stevens, D.D.S., M.B.A. in Port Charlotte will help treat your mouth to a healthier You! Carol W. Stevens, D.D.S., M.B.A., is a board certified Periodontist specializing in the treatment and prevention of periodontal “gum disease” in Port Charlotte, Florida. Dr. Stevens is certified in Laser Assisted New Attachment Procedure (LANAP) for non-surgical treatment, as well as surgical treatments and advanced sedation techniques, if needed. Periodontal diseases are generally caused by bacteria; however, there are other factors which contribute to bone destruction, tooth mobility, and tooth loss. Contributing factors to periodontal disease include all forms of tobacco use, tooth grinding or clenching, poor fitting crowns or restorations, food impaction, poor diet, and systemic diseases such as Diabetes and HIV/AIDS. There are prescription medications which may contribute to periodontal disease and/or gingival enlargement. There are certain periodontal diseases which are more common in specific populations, families, and/or groups of people. Genetics plays a role in a person’s resistance or susceptibility to periodontal disease. Research has shown that approximately 40% of the disease process may be due to genetics, and 60% of the progression of the disease process is directly related to environmental issues which can be modified, and are under our control. Periodontal disease is not normally painful. Most people do not know they have periodontal disease or bone loss until they begin to notice bleeding. Signs of periodontal disease include bleeding gums, lose teeth, drifting teeth, and bad breathe. Often patients are not aware that they have periodontal disease until their tooth is very loose. Periodontal disease often causes no symptoms, especially in its early stages! But don’t be fooled. This “silent” disease can still damage the gums, bone, and other tissues that surround the teeth. Unless it’s treated, this damage will worsen. Eventually this can lead to tooth loss and require an extraction. There is also evidence that the bacteria that cause periodontal disease are linked to more general health problems. These include heart disease, pregnancy complications, and other serious conditions. The good news is that treatment can limit damage and help keep your mouth healthier. Laser Assisted New Attachment Procedure (LANAP) is the newest technology for treating periodontal disease and is offered to patients in our Port Charlotte office as an alternative to conventional gum surgery. So whether you have healthy gums and want to keep them that way, or you already have gum disease and want to control it better, contact Carol W. Stevens, D.D.S., M.B.A. in Port Charlotte and find out how Dr. Stevens can help. And – know that it CAN be treated! The prevention of periodontal disease requires good oral hygiene, a healthy diet, and regular professional care. Good oral hygiene and regular periodontal cleanings are critical to maintaining bone levels, preventing bone loss, and tooth loss. Most patients are able to avoid tooth loss with minimal professional care after the disease process has been managed. Thorough and regular periodontal maintenance therapy (cleaning) on a 3-month interval is most important to preventing tooth loss. Regular, professional dental care and good oral hygiene contribute to avoiding tooth loss for a life time. This is the mildest form of periodontal disease. The gum becomes inflamed. 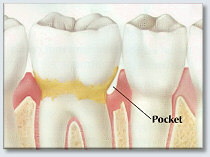 The space between gum and tooth deepens, forming a pocket. Gums may become red and swollen, or may bleed when probed. Or, there may be no symptoms. Gingivitis can often be reversed with dental cleanings and regular brushing and flossing. Left untreated, it can progress to periodontitis. With periodontitis, infection and inflammation spread to the bone supporting the teeth. Ligaments break down and the gums may recede (shrink back). Pockets deepen and can be difficult to keep clean. Redness, swelling, and bleeding may develop or worsen. Bacteria multiply, and infection begins to destroy the bone. As bone is destroyed, teeth may start to feel loose. 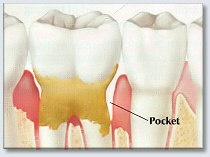 As periodontitis advances, pockets deepen even more and can fill with pus. Around the roots of the teeth, the gums may start to swell. Bone loss continues. The teeth may feel sensitive to heat or cold, and may hurt when brushed. Teeth loosen due to loss of bone and ligament. In some cases, teeth may need to be removed to keep periodontal disease from spreading.